West Indies were crowned the World Twenty20 champions after beating hosts Sri Lanka by 36 runs in a bowler-dominated final at the R Premadasa Stadium on Sunday. Sri Lanka restricted West Indies to 137 for six wickets to boost their chances of winning their maiden World Twenty20 title but the dream did not materialise as they were shot out for 101 runs in 18.4 overs. Skipper Darren Sammy dedicated their triumph to fans back home and said it is a step in the “right direction” and will usher in a new beginning for cricket in the Caribbean islands. An inspired West Indies clinched the crown with a comfortable 36-run victory over Sri Lanka, winning a major global title after over three decades. Shane Watson has emerged as the Player of the Tournament in a unanimous choice. The 31-year-old batted six innings in the tournament, scoring a total of 249 runs at an average of 49.80. He also took 11 wickets at an average of 16.00 and an economy-rate of 7.33 with his extremely useful medium pace bowling. Sri Lanka lost their fourth consecutive ICC World Cup final after the 2007 World Cup, 2009 World T20 and 2011 World Cup. This was West Indies’ first win over Sri Lanka in T20Is after four consecutive defeats. Jess Cameron's show with the bat and Lisa Sthalekar's all-round skills helped Australia retain the Women's World Twenty20 title with a close four-run victory over England in the final on Sunday. Put in to bat, the defending champions, who won the last edition of the tournament in West Indies, made 142 for four from their 20 overs, riding on a strong opening partnership. South Africa have been accused of provoking the text message scandal that led to England batsman Kevin Pietersen being sent into international exile. Pietersen was dropped for the final Test between England and South Africa earlier this year following allegations that he sent texts to South Africans players that contained criticism of then England captain Andrew Strauss during the second Test at Headingley. Paras Dogra struck a strokeful half-century as North Zone piled up a big total of 484 in their first innings to place themselves in a commanding position on the second day of the four-day Duleep Trophy quarterfinal match against West Zone here today. Mahele Jayawardene today announced his decision to step down as the captain of the Sri Lankan T20 team after losing the final. “Just one announcement guys, I have had a chat with the selectors and I have decided to step down as a captain of the Sri Lankan T20 team after the end of the tournament,” Jayawardene said. Red Bull’s Sebastian Vettel won the Japanese Grand Prix on Sunday and blew the Formula One championship wide open with five races remaining after Ferrari’s Fernando Alonso spun out at the start. The Fenesta Open National Tennis Championship will begin at the R.K. Khanna Tennis Complex here from tomorrow with an impressive array of promising players entering the fray to showcase their skills. The National Championship has provided the platform for all the top players of the country to make their mark, though the big boys, once they gain a certain grade, prefer to give the event the miss. Unbeaten Chelsea put their off-field concerns aside to beat Norwich City 4-1 at Stamford Bridge on Saturday and open up a four-point lead at the top of the Premier League. Top-seeded Serbian Novak Djokovic beat Frenchman Jo-Wilfried Tsonga 7-6, 6-2 on Sunday to win his third China Open title in Beijing. Union Minister for Sports and Youth Affairs Ajay Maken today announced that the Central Government would soon launch a national level sports programme known as National Physical Fitness Programme (NPFP) on the pattern of Haryana’s Sports Talent Hunt Programme “Sports and Physical Aptitude Test” ( SPAT). Jeev Milkha Singh, who was in contention during the first two days, faded away over the weekend and finished tied 22nd at the $1.85 million Canon Open here today. Kei Nishikori stunned big-serving Milos Raonic 7-6, 3-6, 6-0 with an electrifying display of attacking tennis to become the host country’s first Japan Open champion on Sunday. Leander Paes and his Czech partner Radek Stepanek faltered at the final hurdle as they suffered an upset straight-set defeat at the hands of Alexander Peya of Austria and Brazil’s Bruno Soares at the ATP Japan Open here today. West Indies were crowned the World Twenty20 champions after beating hosts Sri Lanka by 36 runs in a bowler-dominated final at the R Premadasa Stadium on Sunday. Sri Lanka restricted West Indies to 137 for six wickets to boost their chances of winning their maiden World Twenty20 title but the dream did not materialise as they were shot out for 101 runs in 18.4 overs. Chasing a seemingly modest victory target, Sri Lanka were going steadily at 48 for one before their batting order caved in, partially because of their anxiousness to stay ahead of the par score in case of a rain interruption which seemed so imminent. Skipper Mahela Jayawardene (33) and former captain Kumar Sangakkara (22) got the starts but could not carry on and only one more Sri Lankan — Nuwan Kulasekara (26) — managed double figure in an otherwise abject batting capitulation. Spinner Sunil Narine was the pick of the West Indies bowlers, claiming three for nine runs to cap his excellent run in the tournament. West Indies captain Darren Sammy won the toss but was left to rue his decision to bat first as the Sri Lankan bowlers stifled his batsmen, restricting a side teeming with big-hitters to 32 for two wickets in 10 overs. Spinner Ajantha Mendis (4-12) broke West Indies' back but Marlon Samuels hit a 56-ball 78 to prove that the hosts were not really unplayable as West Indies recovered somewhat to post 137 for six on the board. Skipper Darren Sammy dedicated their triumph to fans back home and said it is a step in the “right direction” and will usher in a new beginning for cricket in the Caribbean islands. An inspired West Indies clinched the crown with a comfortable 36-run victory over Sri Lanka, winning a major global title after over three decades. “Thank you to everyone who supported us. The tournament is for the fans. The Caribbean people wanted this. This moment we're going to live forever. We went through a lot in the last two years,” Sammy said at the post-match presentation ceremony here. “I can't say we are back but this is a step in the right direction," he added. The skipper said, from Jamaica to Guyana, the entire island nation will be celebrating tonight. Watson said at the post-match presentation said: "Although we didn't quite reach our team goal of winning this tournament, on a personal note it's an honour to be named as the ICC World Twenty20 2012 player of the tournament." Chris is always a plus. It is always good to have him in the team and see him enjoying the game with his pals. We have a lot of respect for him in the dressing room. I think the first ten overs were fantastic, they knew they had to go for it. A couple of mistakes on the field and three-four bad overs shifted the momentum. It was tough for us to get into it. The boys tried well but we're disappointed, we could not win in front of the crowd. A couple of overs they went after us. Marlon batted very well. I backed my No. 1 bowler to deliver but Marlon batted very well. We lost momentum when Dilshan fell. We need to sit down, have a good chat, and move on. (I am) thrilled for the first four matches, unfortunately the West Indies were too good in the semifinal. They were deserved winners. Sad for Sri Lanka not to win at home. I have put in a lot of hard work.Can't explain how much it means to me. Thanks to Sri Lanka, I had some good food. They beat us twice, I tell Chris we can't lose thrice. The wicket was a bit slow, today was a different mindset, I decided to attack Malinga their best bowler and it paid off. We are working together as a unit. I think West Indies are going to do well, even in Test cricket. Test cricket is the best cricket. Jess Cameron's show with the bat and Lisa Sthalekar's all-round skills helped Australia retain the Women's World Twenty20 title with a close four-run victory over England in the final on Sunday. Put in to bat, the defending champions, who won the last edition of the tournament in West Indies, made 142 for four from their 20 overs, riding on a strong opening partnership. England lost wickets at regular intervals during their chase and required 16 off the last over but managed 11 to reach 138 for nine. Danielle Hazel needed to hit a six off the last ball for a victory but she could just get a single sparking widespread celebrations in the Australian camp. “So proud of this team," an emotional Australian captain Jodie Fields said during the prize distribution ceremony. “I love this jersey, whenever you put this jersey on, you have to fight hard. England played a really good match, but we had the belief in our team." Jess Jonassen picked up three wickets for 25 while Sthalekar and Julie Hunter shared four wickets between them as Australia dropped a number of catches. Skipper Charlotte Edwards (28) top-scored for England and kept the team in the hunt with four boundaries and a six but the2009 champions lost their way after her dismissal. “Last 18 months we have worked towards this. 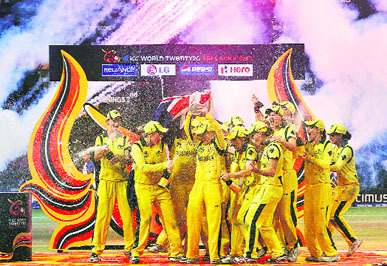 It didn't go our way, but congratulations to Australia,” Edwards, who was adjudged the player of the tournament, said. “We didn't bowl well up front, and just couldn't pin them. I wouldn't change the decision to bowl first. Our bowling is good, the wicket is still good. “It still came down to six off the last ball. It wasn't to be a fairy tale, but hope we have done the country proud." South Africa have been accused of provoking the text message scandal that led to England batsman Kevin Pietersen being sent into international exile. Pietersen was dropped for the final Test between England and South Africa earlier this year following allegations that he sent texts to South Africans players that contained criticism of then England captain Andrew Strauss during the second Test at Headingley. The 32-year-old South Africa-born star was also axed for the one-day series against the Proteas and the current World Twenty20 tournament in Sri Lanka. But KP apologised for sending the messages earlier this week and signed a new central contract with the ECB after the two sides agreed "a process for his re-integration into the England team". And now England and Wales Cricket Board chief executive David Collier has claimed Pietersen was only replying to Blackberry Messenger messages sent by the opposition which he felt were unnecessary. “That's our understanding," Collier told BBC Radio Five Live's Sportsweek programme on Sunday. "I have not seen those messages and no one has kept those messages, that's why it takes some time. “It is a very thin line between fair and unfair. These were responses to messages from certain members of the South Africa team and I would not condone an England player doing it if it was the other way around, and I certainly think they (South Africa) provoked the situation." While Collier is keen to remove some of the blame for the situation from Pietersen's shoulders, he believes the Surrey player and the England team should have handled the situation better. Dogra's 77 pushed North's overnight score of 251 for three to 484 all out in 174.4 overs shortly before close. He hit 10 fours and a six from the 147 balls he faced at the MA Chidambaram Stadium here. An early wicket — in the form of Ajinkya Rahane off paceman Ishant Sharma for a first-ball duck — put West Zone in the back foot. West Zone were six runs for one in one over at stumps on the second day with Kastubh Pawar (4) and Murtuja Vahora (0) at the crease. Three other North batsmen made valuable contributions with Amit Mishra (48), Rishi Dhawan (38) and Nitin Saini (37) chipping in. For West, off-spinner Kamlesh Makwana took a five-wicket haul, giving away 147 runs. After wicketkeeper batsman Nitin Saini fell at his overnight score of 37 (82 balls, 5x4), Himachal Pradesh batsman Dogra and Mayank Sidhana took charge, adding 48 runs between them in 17.5 overs for the fifth wicket. Mayank too made his exit for 20 runs (50 balls, 3x4) when he was caught by Kamlesh Makwana of Samad Fallah. However, Dogra was in aggressive mood and he consolidated the North innings with Rishi Dhawan. The duo batted for over 24 overs before the latter paid the price for trying an ambitious shot off Harmeet Singh and was caught by Ajinkya Rahane for 38 (77 balls, 5x4). Dogra and Rishi Dhawan put on 88 for sixth wicket in 4.1 overs, which remained the high point of batting for the day. Mahele Jayawardene today announced his decision to step down as the captain of the Sri Lankan T20 team after losing the final. “Just one announcement guys, I have had a chat with the selectors and I have decided to step down as a captain of the Sri Lankan T20 team after the end of the tournament,” Jayawardene said. Alonso’s pre-race lead over reigning champion Vettel, chalking up his second win in a row and third of the season, was cut to four points from 29 with the Spaniard in danger of falling behind in South Korea next weekend. “It was an important step today but there’s still a long way,” said Vettel after holding aloft the winner’s trophy and making the familiar raised forefinger gesture as number one. “These things happen and obviously you don’t hope for those things to happen to yourself,” he added of Alonso’s exit into the gravel following contact with former Ferrari champion Kimi Raikkonen’s Lotus. “We have so many races, it could happen. We don’t know what happens in the next race, it’s good to take the points today.” Ferrari’s Felipe Massa came second, 20.6 seconds behind Vettel, for the Brazilian’s first podium finish since October 2010 with Japan’s Kamui Kobayashi delighting his home crowd with third place for Sauber. Only the third Japanese to stand on a Formula One podium, he was the first since Takuma Sato at Indianapolis in 2004. Only Aguri Suzuki, in 1990, had previously finished in the top three at Suzuka. “Fantastic, unbelievable,” he said, sharing a podium with Vettel for the first time since their Formula Three days and addressing the fans in Japanese. Massa seemed so out of practice at being on the podium that he knocked over his bottle of champagne, spilling some of it on the stage before he had a chance to shake the bottle as he collected his trophy. The victory was Vettel’s third from pole in Suzuka in the past four years and he also set the fastest lap after leading from start to finish, with the team warning him to be careful. In truth, he had nothing to worry about with Massa far behind and Kobayashi fighting to keep McLaren’s Jenson Button behind him right to the finish. Button, last year’s winner, crossed the line 0.5 adrift of the Sauber. McLaren’s 2008 champion Lewis Hamilton was fifth ahead of Kimi Raikkonen in the Lotus and Germany’s Nico Hulkenberg for Force India. Venezuelan Pastor Maldonado scored his first points since he won the Spanish Grand Prix, ending a run of nine races without scoring for Williams. Australian Mark Webber was ninth for Red Bull after starting on the front row following Red Bull’s first one-two of the season in qualifying, and then having to fight back from last place after a collision with Frenchman Romain Grosjean’s Lotus at the start. Australian Daniel Ricciardo took the final point for Toro Rosso, denying Michael Schumacher a top 10 placing in what was the German’s final Japanese appearance before retirement at the end of the season. The safety car was deployed after the first lap with Alonso trudging back to the paddock after his Ferrari went spinning onto the gravel and then back on to the track facing the oncoming cars. “Five great races coming! If the enemy thinks in the mountains, attack by sea, if they think in the sea, attack by the mountains,” the Spaniard’s Twitter feed declared. But those who are eager to make a serious mark in the game get an excellent opportunity to capture the spotlight. This year too, almost all those who have been ranked by the All India Tennis Association (AITA), barring those who had featured in the recent Davis Cup tie against New Zealand, have entered for the championship. The competition is expected to be very keen in the men’s, women’s, boys and girls events, and with attractive prize money on offer,the tournament has attracted a large number of entries. That the National Championship is played at the home venue of the AITA is an advantage plus for the players as those who do well will immediately catch the attention of the big bosses, which will benefit them hugely, as the selectors do not have to rely on second-hand information to make their considered judgement. This will be the 18th year the DSCL will be conducting the championship, under the aegis of the AITA. With many courts to choose from at the Delhi Lawn Tennis Association (DLTA) complex, which got an impressive makeover for the Commonwealth Games, it will be of great advantage for the organisers hold the matches on time. The men’s title winner will pocket a prize money of Rs 1.50 lakh while the women’s champion will earn Rs 1 lakh.There are attractive cash prizes for lower order finishers as well, as the Fenesta National Championship offers the highest prize money for a national championship in the country. The event has proved to be the launch pad for many a talented player, and the likes of Sania Mirza, Somdev Devvarman, Sunil Kumar etc had cut their teeth at the Nationals here before making it big. Sania Mirza will be the chief guest on the final, and the incredible response the event has received this year shows that the nationals continue to be the major event for the young players to carve a niche for themselves. Champions Manchester City climbed into second place after preserving their unbeaten record with a 3-0 home win over previously unbeaten Sunderland, while Everton slipped a place to to third after drawing 2-2 at lowly Wigan Athletic. West Bromwich Albion maintained their surprisingly good start to the season and ended the day in fourth spot when Steve Clarke’s side beat Queens Park Rangers, managed by his old Chelsea team mate Mark Hughes, 3-2 at The Hawthorns. QPR stayed bottom without a win and with just two points while West Brom have now won their first four top flight home games for the first time since the 1919/20 season when they won their only English championship. Arsenal came from behind to beat West Ham United 3-1 and climb to fifth after Frenchman Olivier Giroud scored his first goal since a close season move from Montpellier while Theo Walcott and Santi Cazorla struck in the last 13 minutes. Mohamed Diame had put the Hammers ahead with a brilliantly taken angled strike in the 21st minute. Chelsea top the table with 19 points from seven games, followed by Manchester City on 15, Everton and West Brom on 14 and Arsenal on 12, level with Manchester United who visit Newcastle United in Sunday’s late kickoff. Tottenham Hotspur, who are seventh on 11 points, also play on Sunday when they face lowly Aston Villa at White Hart Lane. European champions Chelsea made headlines for all the wrong reasons in the morning newspapers after Friday’s publication of the findings of an FA hearing that questioned the accounts given by skipper John Terry and defender Ashley Cole in the racism case involving Queens Park Rangers defender Anton Ferdinand. Terry, facing a four-match ban and £220,000 ($356,200) FA fine for his racial slur against Ferdinand last year, and Cole, whose evidence was questioned in the 63-page written document, both played against struggling Norwich, who took a surprise lead through Grant Holt after 11 minutes. But Chelsea, playing with style and panache, replied four times with goals from Fernando Torres, Frank Lampard, Eden Hazard and a superb volley from Branislav Ivanovic. Lampard’s strike was his 129th Chelsea goal in the English Premier League, putting him level with Bobby Tambling as the club’s joint-highest top-flight scorer. Torres maintained his good start to the season with a header to pull the home side level in the 14th minute before Lampard drilled in from 15 metres to put Chelsea ahead eight minutes later. Hazard made it 3-1 after 31 minutes as Norwich, who lost 5-2 at home to Liverpool last week, looked set for another hiding. But the visitors stemmed the flow of goals after that until Ivanovic struck with a volley 14 minutes from time. Chelsea manager Roberto Di Matteo said he was pleased to put the events of the last few days behind him. Chelsea have now won six and drawn one of their seven games while Norwich remain winless and second from bottom with just three points. Manchester City climbed to second after beating Sunderland at the Etihad Stadium where Aleksandar Kolarov, Sergio Aguero and James Milner were on target. Like Chelsea, City remain undefeated and ended Sunderland’s unbeaten league record in the process. With seven changes from the side that drew 1-1 at home to Borussia Dortmund in the Champions League on Wednesday, Roberto Mancini’s team took an early lead with a blistering free kick from Kolarov after five minutes. World number two Djokovic dug deep in the first set after an early trade of breaks to win a close tie-breaker and then broke the third-seeded Tsonga twice in the second set. Sunday’s victory gave Djokovic, who also won the China Open in 2009 and 2010, his fourth title of the year. The 2012 Australian Open champion will remain in the hunt to take back the world number one ranking from Roger Federer at the end of the year. In the women’s event, world number one Victoria Azarenka won her first title in more than six months when she beat Russian Maria Sharapova 6-3, 6-1 in the final. “I’m really happy to finally have a really good result here — I’ve been coming here for the last four years and I’m happy I could finally show my game and hold the trophy,” Azarenka said. The Planning Commission has approved the programme and it would be formally launched shortly, he said. Maken was addressing a meeting after laying the foundation stone of the Football Academy at Dariyapur in Fatehabad. Maken and Haryana Chief Minister Bhupinder Singh Hooda also laid foundation stone of a sports hostel having capacity of 100 inmates. Lauding the Haryana Sports Policy, Maken said that the state has provided the best promotion to sports in the country. Hooda said that the state government was contemplating implementing the Right to Play Act on the pattern of Right to Education Act. He said under the SPAT programme, the promising players in the age group of 8-19 years are picked up for training. In the first phase of the programme, 80,000 children applied and 43,000 of them appeared for test, whereas in the second phase there were 20 lakh applicants. The government, he said, had selected 5,000 of the applicants and is providing monthly scholarships and training to them. Maken also inaugurated the state’s first Sports Training Centre of the SAI in Meham, Rohtak district, today. Jeev Milkha Singh carded 71 in the final round. Jeev, who began the week with superb rounds of 68 and 70 and was as high as sixth, slipped to 22nd by the end after playing the final two rounds in 74 and 71 at the 7,191-yard Totsuka Country Club in Kanagawa Prefecture. Meanwhile, Yuta Ikeda ended a 15-month winless run during which he came close many times. He shot a three-under 69 for a four-day total of 17-under 271 and it gave him a three-stroke win from fellow-Japanese Taichi Teshima and Korean Hwang Jung-gon. Ryo Ishikawa (73) was in tied fourth, six shots behind the winner. It was Ikeda’s 10th win on Japan Tour but the first since the Sun Chlorella Classic 15 months ago. He also won Canon Open once earlier in 2009. It was the eighth seed’s second career title after winning in Delray Beach in 2008 and will elevate the 22-year-old from 17th to 15th in the world rankings. The fourth seeded Austrian-Brazilian pair defeated top seeds Paes and Stepanek 6-3, 7-6 (5) in an hour and 46 minutes in the $1,280,565 hardcourt event to win their second ATP World Tour doubles titles in as many weeks. Peya and Soares added the Rakuten Japan Open Tennis Championships trophy to their Malaysian Open trophy. But Paes and Stepanek have clinched their first team berth at the Barclays ATP World Tour Finals in London next week, after they booked a place in the Tokyo final. New Delhi: Phil Heath successfully defended his Sheru Classic Men’s Professional Bodybuilding title after an exciting final here today. This is the second title that Heath has won in the last one week after winning Olympia last Sunday. He faced stiff competition from Kai Greene, who finished runners-up yet again. Heath took home the winner’s cheque of $60,000. Shimla: Chandigarh driver Sunny Sidhu, six times winner of Maruti Suzuki Desert Storm, today bowed out of the 14th Maruti Suzuki Raid de Himalaya due to mechanical failure of his vehicle on day one of the competition which saw miraculous escapes of some rallyists from four mishaps. Sunny, a top contender for the Raid crown, faced engine trouble in the third competitive stage of the event today from Chimni to Khanag. He was driving a Mahindra XUV for Team Mahindra at the event.